On Friday, September 28th, 2018, the Dominican Sisters of Hope announced the preservation of 34 acres of the 61-acre property known as Mariandale in the Village of Ossining. Mariandale is owned by the Dominican Sisters of Hope and is situated along a stretch of the historic Hudson River. The property will continue to be owned and managed by the Sisters as a retreat and conference center. Westchester Land Trust will hold the conservation easement, which prohibits further development and protects significant ecological resources, forever. 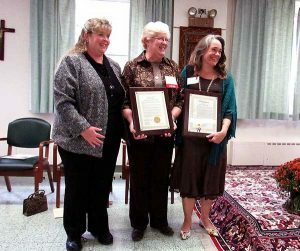 Liz Feldman of the Town of Ossining (left) and Ossining Mayor Victoria Gearity (right) both presented the Dominican Sisters of Hope with proclamations for the Day of Hope in Ossining. To announce this news, the sisters held a celebration, which was emceed by Kacey Morabito Grean, morning DJ at radio station WHUD. Dozens of community members including New York State Assemblywoman Sandy Galef, Westchester County Deputy Executive Ken Jenkins, Westchester County Legislator Catherine Borgia, and Ossining Mayor Victoria Gearity were in attendance. The afternoon began with an opening prayer led by the Dominican Sisters followed by Ossining Village Mayor Victoria Gearity and the town of Ossining declaring September 28th as a Day of Hope. 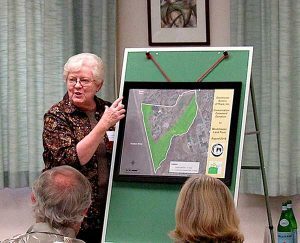 Sister Lorelle Elcock, O.P., Prioress of the Dominican Sisters of Hope, unveils the land conservation easement at the September 28th press conference. The Sisters, along with Westchester Land Trust Vice President Kara Whelan, unveiled a map delineating the conservation easement boundaries and signed a copy of the conservation easement. The afternoon closed with a prayer followed by refreshments and tours of the land. ABOUT THE EASEMENT: A conservation easement is a voluntary legal agreement between a landowner and a land trust that permanently restricts the development of a property in order to protect the land’s important conservation values. 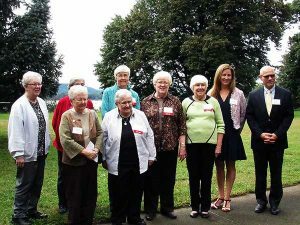 This September, the Dominican Sisters of Hope will make official the preservation of 34 acres of the 61- acre property known as Mariandale, in the Village of Ossining. The conservation easement was donated by the Sisters, for which they received no financial benefit. The property will continue to be owned and managed by them as a retreat and conference center. The undeveloped portion of the campus will be protected through conservation easement that prohibits further development and protects significant ecological resources, including the Hudson River. The easement does not extend to the already developed area of the campus, so the Sisters will have the option to renovate and redesign the already extant buildings. The easement was created in partnership with the Westchester Land Trust. Westchester Land Trust retains the obligation to ensure that the terms of the conservation easement are honored forever. 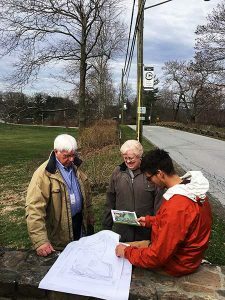 Sister Lorelle Elcock, O.P., Prioress of the Dominican Sisters of Hope, works with Westchester Land Trust to draft the land conservation easement in 2017. ABOUT THE PROPERTY: Mariandale includes a retreat and conference center, as well as a labyrinth, gardens, and a nature trail for retreatants to meander. The conserved land consists of a variety of habitat types, including woodlands, meadow, wetlands, and a steep ravine through which flows a stream on its way to emptying into the Hudson River. Preservation of land along the Hudson River is a stated priority of the 2016 New York State Open Space Conservation Plan, and the importance of the Mariandale property to the Ossining community has been widely recognized in the Village’s land use planning documents. The property is adjacent to the Village of Ossining’s 30-acre Crawbuckie Nature Preserve, so that together, nearly one mile of uninterrupted Hudson River shoreline now is protected in perpetuity. 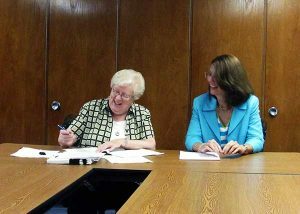 Sister Lorelle Elcock, O.P., Prioress of the Dominican Sisters of Hope, signs the land conservation easement along with Westchester Land Trust president Lori Ensinger. ABOUT WESTCHESTER LAND TRUST: Since its founding in 1988, Westchester Land Trust (WLT) has preserved nearly 8,300 acres of open space including more than 700 acres of preserves owned by the organization which are free and open to the public year-round. Westchester Land Trust works with public and private partners to preserve land and to enhance the natural resources in Westchester and eastern Putnam counties—a densely populated region under persistent threat from the pressures of development. Through the use of conservation easements and outright acquisition, WLT’s efforts benefit the long-term health of these communities by safeguarding air quality, food supply and community character, as well as critical watershed areas. A 501(c)(3) non-profit organization, Westchester Land Trust relies on grants and individual donations to support its preservation and community outreach programs. For more information about WLT, please visit westchesterlandtrust.org.